When Erin Greider first walked into The Bookman, she didn’t know where to start. She wandered through aisles of bookshelves, overwhelmed by the number of books to see, most of them unfamiliar titles. The sophomore screenwriting major quickly found her way to the film history section, which took up an entire bookshelf. After a few minutes of browsing, she had to drop off the ten books she was holding at the front counter because her arms were sore from the weight. She walked out of the store an hour later with a box full of over a dozen books, mostly about film noir and Alfred Hitchcock. 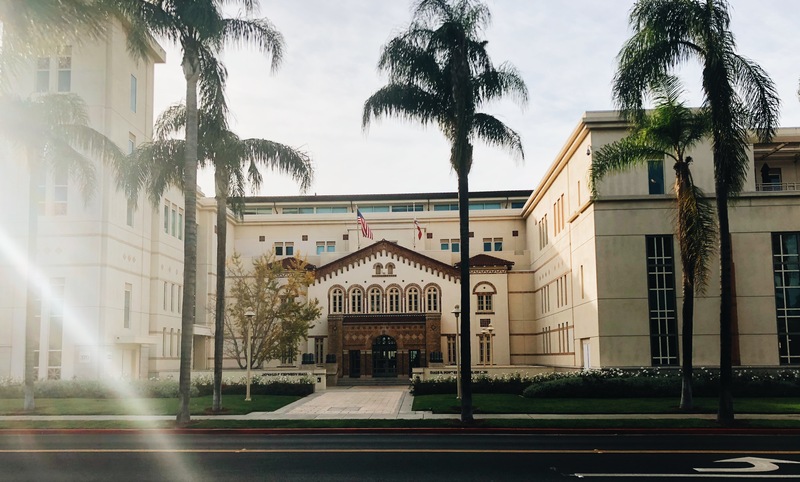 The bookstore soon connected her to a community of book lovers, most of which were fellow students at Chapman University who visited The Bookman weekly simply for the pleasure of browsing. “There’s no place like it. 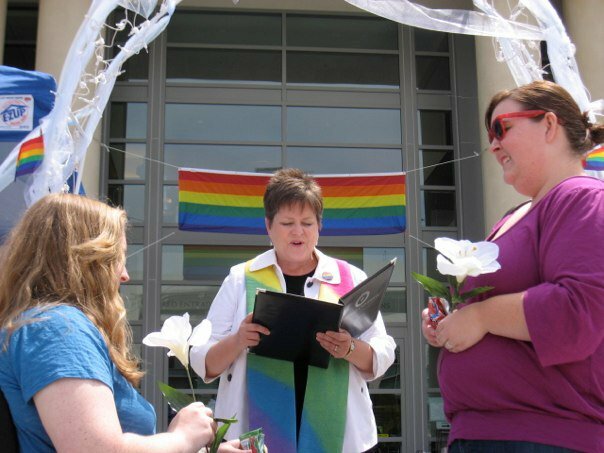 It’s special,” Greider said. In the age of Amazon and online book-selling, places like The Bookman are rare and hard to find given the uncertainties of running a brick and mortar store in the digital age. While The Bookman has managed to thrive for 29 years, when a new owner purchased their building on 840 N Tustin St. and raised the rent, the independent used bookstore was forced to leave. 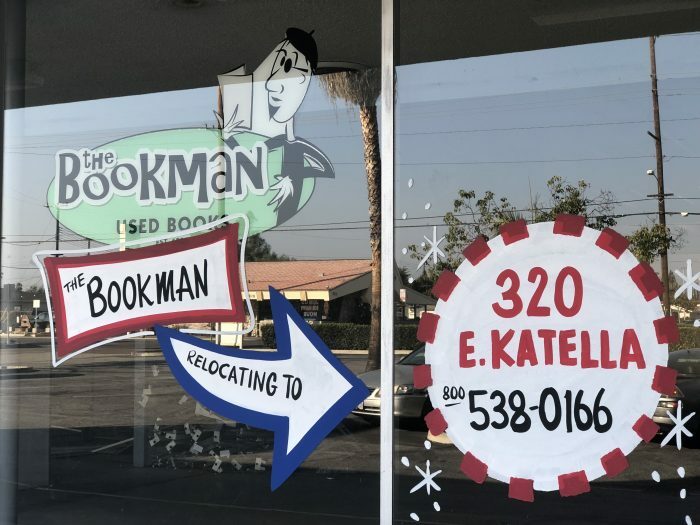 Though the owners found a new location on 320 E Katella Ave. just a few blocks away, unapproved city permits and construction delays has kept The Bookman out of a building for three months and its community of Chapman customers anxious for the store’s reopening. Since Aug. 31, the last day The Bookman could occupy their old location, the store has been camped right outside its new location, an old warehouse showroom for Biard & Crockett Plumbing Service. 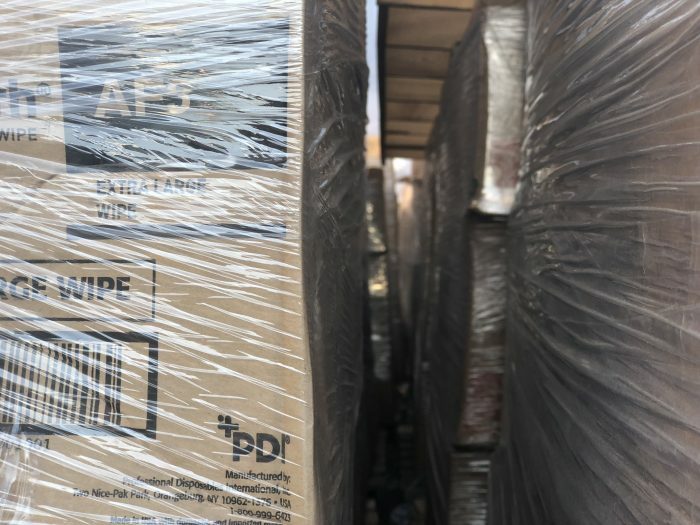 Its books hide in stacks of tarp-covered cardboard boxes about five feet high right next to a cluster of empty bookshelves. Unable to move into its new location, The Bookman waits in the parking lot. Photo by Rachel Ledesma. 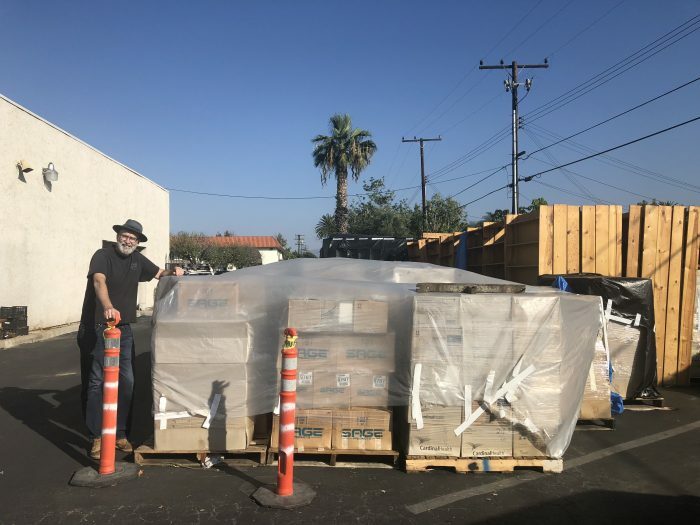 Co-founder, David Hess, said he never expected for The Bookman to be reduced to cardboard boxes in a parking lot. “What bothers me is the not knowing. The helplessness. I can’t really do anything to make the store reopen,” said Hess, co-owner along with Paul Bonaventure Jr. of The Bookman. Hess and Bonaventure Jr. have been waiting to move into the store since September, when they intended to open the new location. Frequent customer, Maddy Kimmell, was saddened when she learned of the store’s relocation but looked forward to its quick reopening. When the store had still yet to reopen in late October, she began to get worried. “I assumed they’d be open and selling in no time. It was kind of a shock to see their opening date pushed back again and again,” said Kimmell, a junior screenwriting major. In order to reopen, the new location’s floor plans and architectural stability must be approved by sending in permits to the city. Neither of the owners expected that three months later they’d still be waiting for these permits to be approved. “They say we’re four or five days away from approval, but they’ve been saying that for a while,” Hess said. 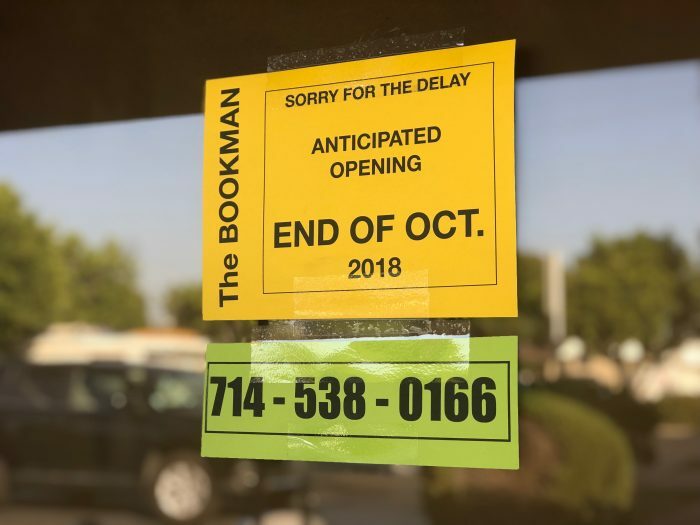 After September came and went, The Bookman was expected to open in October. Photo by Rachel Ledesma. Hess said he doesn’t have any communication with the city of Orange, relying on updates from construction workers who apply for the permits. According to Hess, no one knows why the process has taken so long or what can be done to expedite it. As a result, Hess and Bonaventure Jr. have been left to their own devices in order to keep The Bookman alive. In a makeshift office at Bonaventure Jr.’s house, the two sell “warehouse books” online. 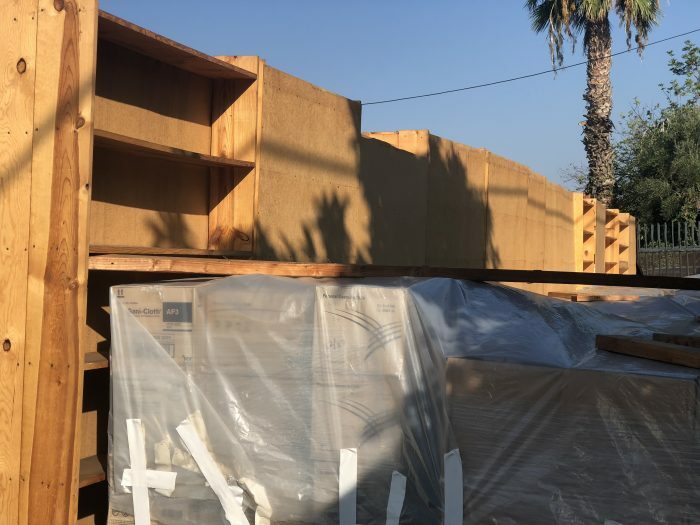 Though the online sales help pay the bills for the storage units they were forced to rent during the move that contain 300 bookshelves, the register, and of course, books, it isn’t enough to survive on, Hess said. Financial struggles aren’t anything new for The Bookman. Before the store’s move, Hess launched a fundraiser on GoFundMe which raised $11,000. All of the money was spent during the move, going toward a truck rental and moving pallets, and now not a cent remains. “I can’t afford to pay anybody anything anymore. All the money’s gone,” Hess said. All five of The Bookman’s employees were put out of work when the store moved. Though some were able to find other side-jobs, most were left without a job or a paycheck. 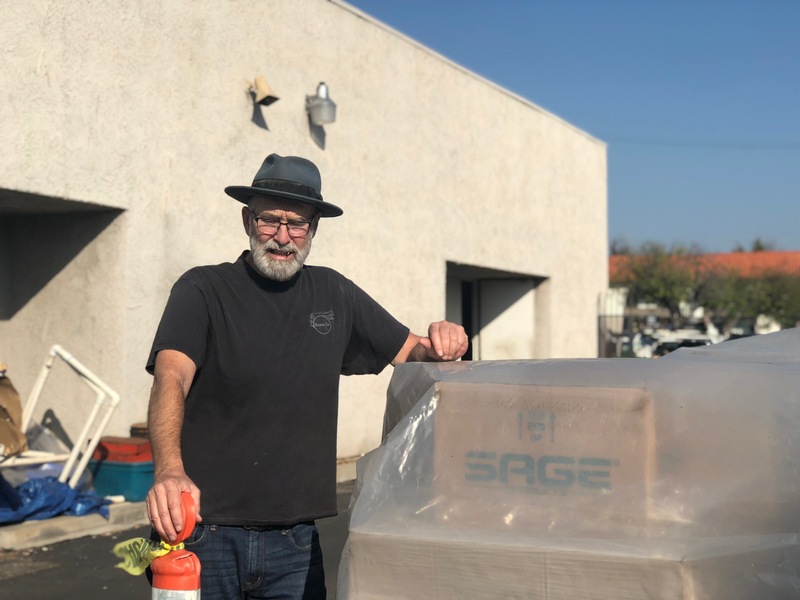 Salesclerk, Steven McMurray, considers himself one of the lucky ones as he is retired and not reliant on income from his job at The Bookman. However, the loss of the job hasn’t been easy. “For some of the employees it’s depressing. For me, it’s sad and boring. My job was the one outlet I had to work with books and to work with people,” McMurray said. Since the store’s closing, McMurray has been waiting eagerly for a call to return to work, but communication between the former employees has been reduced to once a week. The entire situation has left McMurray confused, who said he doesn’t understand how landowners can raise the rent on good, longtime tenants. It took four full days for The Bookman to be moved from its old location to the new location. Photo by Rachel Ledesma. Hess did not provide contacts for the new location’s contractor or construction workers. 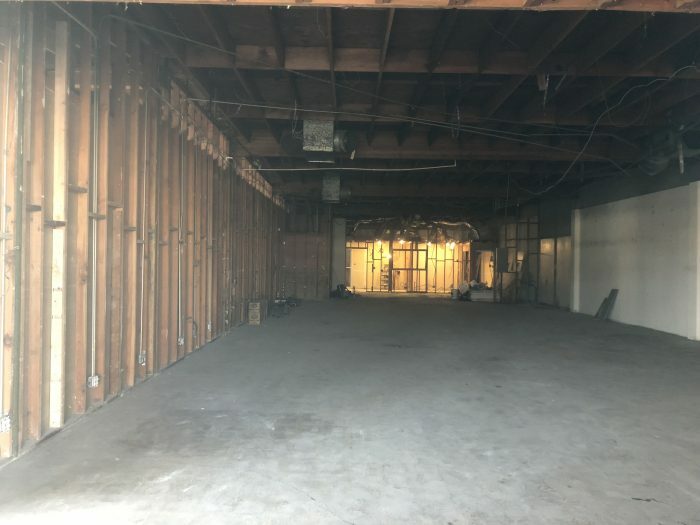 The building contractor of the Tustin location declined to identify the new owner of the building. The city of Orange did not reply to any inquiries regarding the status of the new location’s permits. When The Bookman first received notice of the rent increase, McMurray couldn’t help but think of Book Baron, a used bookstore in Anaheim, where Hess met The Bookman’s co-founder, Paul Bonaventure Sr. When a new landowner increased the rent of Book Baron’s building, the bookstore was forced out and closed after 20 years of business in 2007. What happened to Book Baron is a common fate amongst used bookstores. According to Hess, there were more than 30 bookstores in the Orange County area in the ‘90s. In fact, there were four bookstores surrounding The Bookman’s old Tustin location. All have since closed, since Hess, for the same reason: rent increase. Bookstores have been closing across the entire country as rents are hiked beyond what bookstores make in revenue. The fate befell the famous Drama Book Shop in New York when it closed in Oct. after its rent skyrocketed to $20,000 a month, according to The New York Times. For Greider, bookstore closure is a sad reality she has grown used to. Greider said that before finding The Bookman, she witnessed some of her favorite used bookstores in Los Angeles close due to rent increase. Not only has each closure left Greider without reading materials and an important learning space, but upset as to why the rent was increased in the first place. “It’s commercial real estate. People are paying high prices for buildings, so owners have to pump up the rent to pay for it,” McMurray said. That doesn’t make the reality of closure any more digestible. Yet for The Bookman, permanent closure is unlikely. Even though their sales are currently nonexistent, the store was voted the Best Bookstore by OC Weekly in October. “I guess you could say we’re the best closed bookstore around,” Hess said. 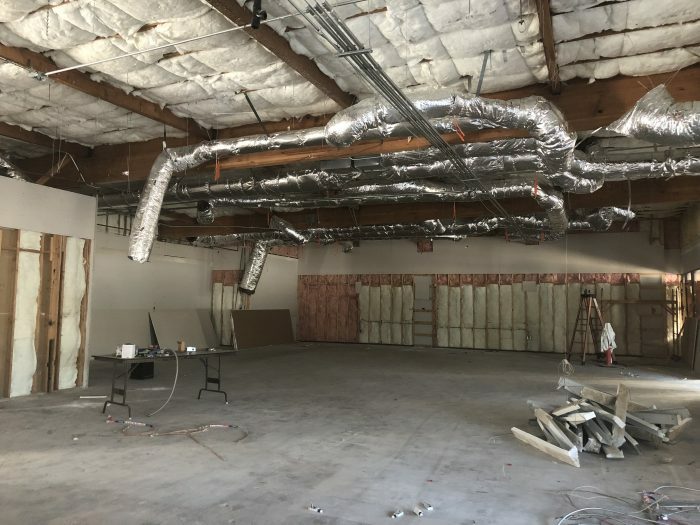 Though the new location has yet to be approved by the city, some progress has been made as new air conditioning units and ducting have been installed. Photo by Rachel Ledesma. Hess has trouble identifying what has caused the bookstore to stay afloat while many similar stores have closed, but said it probably has something to do with just how long the store has been around and the reputation it has built for itself as a community institution. To former employee, Hugh Blake, who worked at the store when he was a teenager in the ‘90s, it’s because the bookstore has always been ahead of the curve. “It was one of the first independent bookstores that got their inventory online. It successfully merged the business model of being online and a classic brick and mortar store,” said Blake, a philosophy professor at Chapman University. With the book-selling knowledge and experience from having worked at Book Baron, Hess and Bonaventure Sr. decided to start The Bookman. Knowing the business inside and out, they purchased and moved into the location on Tustin and started selling books, most of which came from their own personal collections. “At the end of the day, I had to give them up. The store needed the money more than I needed them. I wanted the store to be successful,” Hess said. As inventory and business grew, Hess and Bonaventure bought the adjacent space next door, a beauty supply store, and eventually the space next to that, a curtain store, carving doorways in the walls and creating a single space. A large part of the store’s success is its personal service, which has resulted in strong bonds with many customers that have lasted years and even decades, said McMurray. It’s these bonds that have kept The Bookman going for the past three months despite not having a physical location. Hess said he receives calls everyday from customers asking for updates and an estimated date for the store’s relaunch. Some customers even go so far as driving to the store’s new location. All Hess can do is promise them the store will be opening soon, though the exact date is unknown. “Everybody wants us to get back open. The Bookman is a community place. People want that back,” Hess said. Still, Hess is certain that the move will have cost him customers. Hess, who is 63, runs the store’s Instagram, posting daily to remind his followers that the store has not disappeared. But posting pictures of books from his home instead of the store is a painful process for Hess, who never wanted to move locations and is still trying to adjust. Others don’t see the move as detrimental. “The fact that they’ve moved isn’t so much a bad thing. 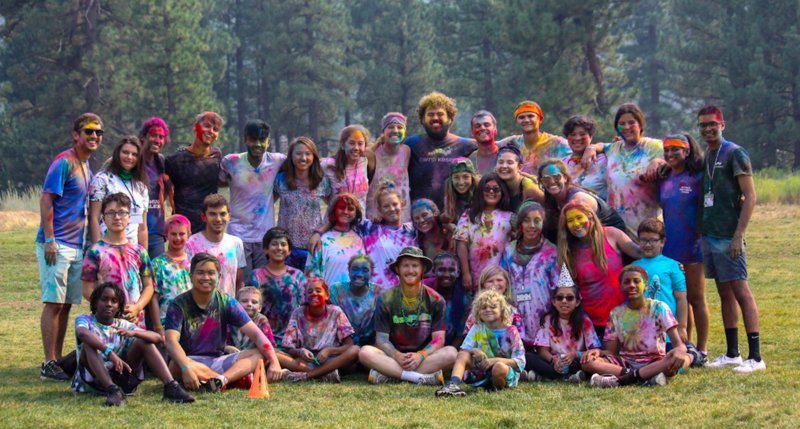 They’re still in Orange and still an institution,” Blake said. The Bookman’s old location on Tustin empty for the first time after 29 years of business. Photo by Rachel Ledesma. However, during the move, The Bookman had to face the reality of downsizing its vast collection. The Bookman had four days to completely empty the store and bring it to the new location. They couldn’t afford to take every book, especially considering that the new location is 2,000 sq. ft. smaller than its original location, which was 6,000 sq. ft. As a result, they got rid of 50 boxes full of books, somewhere in the hundreds of titles, donating them all to a local Goodwill. Though the decision was difficult, a majority of the books were either outdated or just didn’t sell well, Hess said. More adjustments are to come in the future of The Bookman once its doors are open. While they may have to shed more books, Hess said he is looking forward to making changes. Poetry readings, live bands, book clubs and reading groups are all new activities Hess wants to include in The Bookman’s rebranding. While customers like Greider visit The Bookman primarily just to browse, she said events that establish the store as a community space are something she looks forward to. “Although I know they’ll always be the same bookstore everyone knows and loves, a part of me will always miss their old location,” said Greider. While he finds himself missing the old location, Hess is more than ready after endless weeks of boredom to get the store up and running again. “The thing I’m most looking forward to is getting started. When they tell me ‘it’s all yours.’ I’ll come down here and start putting shelves up,” Hess said. Hess said he also plans on following through with all of his customers’ offers to help and amassing a volunteer crew to get The Bookman open again. Thanks to a scale model Hess and Bonaventure Junior assembled, Hess said the store will be up relatively quickly once the city approves the permits. Underneath the plastic and the cardboard, Hess and Bonaventure Jr. have organized each box according to book section in order to speed the reshelving process. Photo by Rachel Ledesma. The only thing Hess is nervous about is the books. Due to a bit of rain and the Santa Ana winds, Hess is concerned some of the books may have been damaged. Still, he’s optimistic that the shrink wrap that he covered the books with did the job. “If they’re ruined what am I going to do?” Hess said. Hopeful that the books are undamaged, Hess is counting down the days until the store reopens, which he hopes is by the beginning December. Though he can’t give an exact date, he’s certain it’ll be before the end of this year. “We’re trying our best. We’re going to get these permits approved. We’re coming,” Hess said. Previous post: Is Trump to blame for the rise of anti-Semitic crimes?